Airstrip Community - Ocala, FL Aviators! Welcome to your dream home located in the most upscale Fly-In community, Jumbolair! 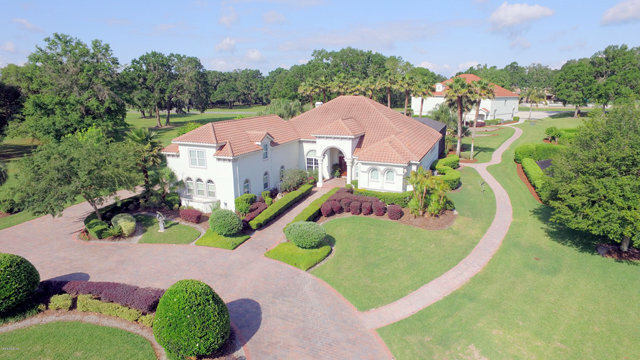 This spectacular home and it's matching hangar will not disappoint. It's loaded with every possible amenity and finished with the utmost style. Newly remodeled, this home features a wine cellar, His & Hers Master Bathrooms and closets, travertine flooring, multiple wet bars in entertaining spaces, gas fireplace, coffered ceilings, and much, much more! Private climate-controlled hangar is immaculately outfitted with full kitchen, additional wine cellar, & basketball court. Solar heated, zero entry salt pool & spa beckon from the screened lanai complete with spacious cabana. This home truly leaves nothing to be desired!